1) Shinsuke Nakamura: So, I watched my first full NJPW show this week and it delivered in spades. A lot of different performers shined bright on this night, but none shined brighter than the IWGP Intercontinental Champion himself, Shinsuke Nakamure. He defended the title, successfully, against Kota Ibushi in what is my match of the year. I understand that it is indeed only a few days into 2015, but you'll be hard pressed to find something that can top it at any point this year. It was hard hitting, featured a lot of near falls and went down to the wire. 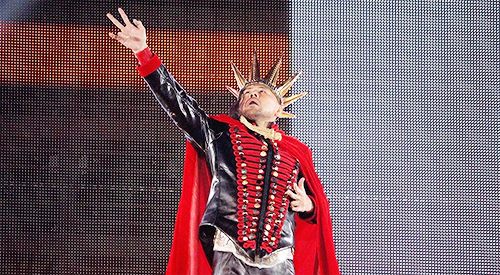 Nakamura retained but everything about him screams star. The in ring ability, his entrance, his charisma and everything in between. 2) Hiroshi Tanahashi: Despite going on after Shinsuke Nakamura and main eventing Wrestle Kingdom 9, Hiroshi Tanahashi couldn't outshine him. He did however have a great night. His main event match against Kazuchika Okada was fantastic. He impressed the hell out of me with some great spots like his diving frog splash into the crowd and retained his title in a huge match. He stood tall to close a very important show that proved how valuable he is. Like a lot of NJPW guys, I haven't seen as much of Tanahashi as I'd like, but he is quickly moving towards the top, along with Ibushi, Nakamura and Okada, of my must see list. They are making my decision to subscriber to NJPW World look like a brilliant move. different way for my number three choice. The final Raw of 2014 was one of the best episodes of the entire year and one of the key moments was the Usos pulling out an unexpected WWE Tag Team Title victory. They've easily been the best tag team in the WWE in 2014 and one of the best things about the program period. While Miz and Mizdow were fresh as Champions, their split seems inevitable and putting the belts back on the Usos is a safe move. They almost never have a bad match and I fully expect this to lead to them putting over the Ascension for the belts somewhere down the line. Adding to their weeks, the Usos also won a tag match against their rivals, Goldust and Stardust on Main Event, before coming out on the winning end in a six man tag on Smackdown. Expect more excellence from the Usos in 2015. 4) AJ Styles: I've expressed my love for Daniel Bryan among others, but since I first saw him in 2005, AJ Styles has been my favorite wrestler. He was one of the reasons why I stuck with TNA for so long and, I pretty much gave up on the company when watching him get mishandled became too much. Enter his emergence in NJPW and I began to read that AJ Styles was doing fantastic work down there. He won the IWGP Championship and joined the Bullet Club. 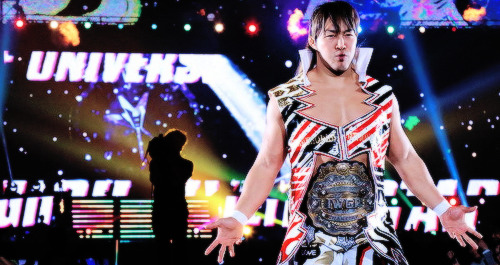 While he did lose the belt to Hirohi Tanahashi, he stayed strong at Wrestle Kingdom 9. On the big stage, AJ dispatched of Tetsuya Naito with a top rope Styles Clash. I know it's not relevant to this week, but earlier today, AJ took out Tanahashi and challenged him to a rematch for the IWGP Championship. It's very clear that the move to IWGP has rejuvenated the career of AJ Styles and Wrestle Kingdom 9 was an indication of that. 5) Kota Ibushi: Honestly, there isn't much that I need to write here. In my write up for Shinsuke Nakamura, I expressed how impressed I was with Kota Ibushi during their IWGP Intercontinental Championship match. I had seen Kota in Ring of Honor back in 2008, but this was a different competitor. I do not exaggerate when I claim that it will be very tough to top their match in the next 360 or so days. Kota is legit.